The SAP Solution Manager is the standard tool to blueprint and document SAP ERP solutions. It concentrates on standard SAP transactions and the scoping and customizing of ERP solutions. On the other side SAP BPM is the SAP tool to automate and execute business processes. Both tools are based on SAP NetWeaver, but they are not linked directly together. You may wonder how to customize your SAP solution and to combine them in a project with the new approach of BPM automation. BPM-X is the tool to link modeling tools, repositories and BPM tools. 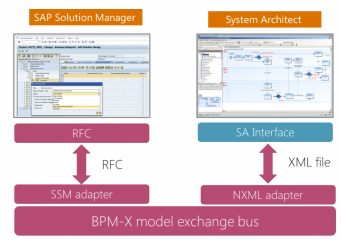 Different tools can be plugged into the BPM-X model exchange bus by specific adapters. Let’s take a look at your business architecture and how to link your tools and model content (say blueprint) together. Coming top-down from the functional break-down to the operational level of business process, you further have a decomposition of business processes to business procedures supported by SAP transactions. Here on the implementation level SAP Solution Manager plays its role to document the SAP customizing and offers the modeling front-end (say BPA tool) the capability to map SAP ERP as defined by process-steps and transactions. To build a scenario the following figures are depicting IBM Rational® System Architect as BPA tool, but it could be any other tool as well. 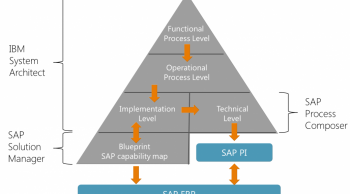 The implementation level (defining the SAP blueprint, see also the post about APQC capability maps) is mapped to the more technical level of business procedures to be automated and executed by SAP BPM and the PI (Process Integration) engine. SAP BPM runs with BPMN and the PI directly executes BPMN process models (with the needed technical details for sure). The orchestration of the BPMN for execution is done by SAP Process Composer- I will write more about this below. Business Architecture and Tool Landscape with a decomposition down to implementation and technical levels. Coming to the big picture we see the tool stack based on SAP Solution Manager and SAP BPM. 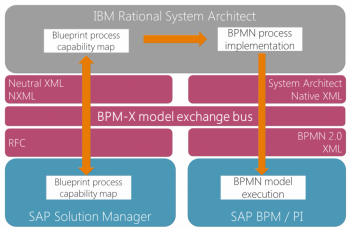 The BPM-X model exchange bus bridges both tools and process repositories with specific adapters and allows the modeling front-end System Architect to blueprint and scope the SAP ERP solution on the one hand and to map the BPMN processes into the technical level for process execution on the other. The technical integration between SAP Solution Manager and the BPA tool is RFC on the SAP side (Remote Function Calls; the standard for how SAP communicates internally) and XML in the BPA tool side. The BPA tool takes the process content from the SAP blueprint to model the procedures based on SAP process-steps and transactions. This works bi-directionally to synchronize the process repositories of SAP Solution Manager and of the BPA tool. SAP Solution Manager bi-directional connected with the BPA modeling tool. Now coming to SAP BPM, many people are wondering how all these technologies fit together. SAP BPM is the umbrella terminology for the BPM part of the SAP NetWeaver Developer Studio. The orchestration (modeling) of SAP BPM processes is done with BPMN; the execution is performed by the SAP PI process integration engine (formerly known as SAP XI). 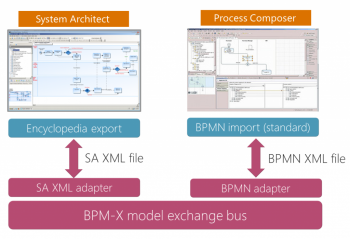 In the BPA tool the procedures on the implementation level a selectively exported into the native XML format and transformed by the BPM-X into the BPMN format so SAP Process Composer can go to work (see also a post about BPMN model exchange). Beside the technical format mapping also the model meta-mode and notation is mapped into the SAP Process Composer name space. Linking the BPA Modeling Tool with SAP Process Composer. So you can see from a technical standpoint how we can have the BPMN procedures modified in the SAP BPM stack transferred back into the repository of the BPA tool, e.g. for analyzing, publishing, reporting and to build a more comprehensive documentation. This example shows how to build a more complex scenario for SAP ERP projects linking different methodologies, modeling conventions and tools all together.